Over in Shoreditch, just a few minutes walk from where I sit writing in Spitalfields, is the site of a seventeenth century playhouse called “The Theatre” built by James Burbage in 1576, where William Shakespeare’s career as a dramatist began. In this, the first custom-built public theatre, Shakespeare played as an actor and his first plays were performed, notably Romeo & Juliet and an early version of Hamlet. Stepping through a blank door in the wooden hoarding in New Inn Yard, I walked along a raised pathway to look down upon the archaeological dig and see where the earth has been painstakingly scraped back to reveal the foundations of the ancient playhouse. 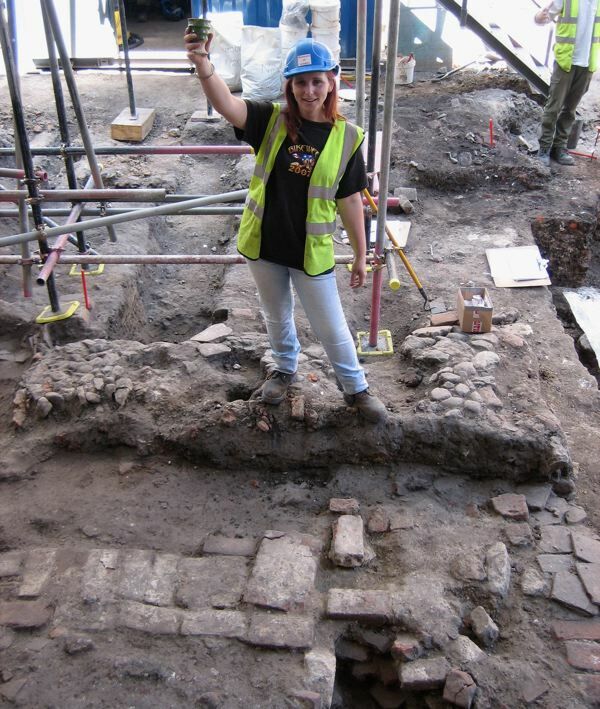 Senior archaeologist Heather Knight of the Museum of London indicated the section of curved stonework which comprised part of the inner wall of the theatre and next to it a section of the paving of the passage where, more than four hundred years ago, the audience walked through into the body of the theatre, once they had paid their penny admission. Beyond this paving, a beaten earth floor has been uncovered, sloping gently down in the direction of the stage. This is where the audience stood to watch Shakespeare’s early plays for the first time. For any writer, Shakespeare is a name that has a resonance above all others, and once Heather Knight explained what I was seeing, it took a while for the true meaning to sink in. My head was full with the cacophony of the dusty sunlit street and the discordance of heavy traffic and, superficially, the site itself was like any other archaeological dig I have visited. There was no poetry in it. But then the words of Hamlet came to me, “To die, to sleep. To sleep, perchance to dream. Ay, there’s the rub. For in that sleep of death what dreams may come, when we have shuffled off this mortal coil, must give us pause…” And my stomach began to churn because I knew I was standing on the other side of Shakespeare’s unfathomable dream. It was as if I could feel the tremor of the London earthquake of 1580 coursing through my body. The monstrous city grew diaphanous and the street sounds faded away. We know no more of what happens in the sleep of death than Shakespeare did. Yet we can say we do know the literal substance of the dreams evoked by these lines from Hamlet – the things that were to come in the space where Hamlet’s words were spoken by James Burbage’s son Richard, who was the first to play the role. We know things unknown to the writer or the actor or the audience in that moment, and, in this sense it may be said that we ourselves (even the archaeologists) are all part of Shakespeare’s boundless dream within the sleep of his own death. We know that after a disagreement in 1598 The Theatre was covertly demolished by the theatre company while the freeholder Giles Allen was away for Christmas and the materials used to construct The Globe in Southwark the following Spring. We know that a factory was built on the site in the seventeenth century, then a house in the eighteenth century, and a warehouse in the nineteenth century until it became a lumber yard in the twentieth century, before archaeologists came along with sonar devices in the twenty-first century to ascertain the position of the theatre – although the workers in the lumber yard and all the local people always knew the yard was on top of “Shakespeare’s Theatre”. But it was never Shakespeare’s theatre in any real sense, it is unlikely the audience here were aware of any particular significance in the event, when they heard his words, because he was an unknown quantity then. Plays were performed just once from cue scripts without any rehearsal or expectation of posterity. Each actor had a roll of paper with their character’s lines, plus their cue lines – so they knew when to speak. The implications of this were twofold. Firstly, the actors had to listen attentively to each other so they did not miss their cues. Secondly, beyond a broad knowledge of the story the actors might not know exactly what was going to happen in a scene. It placed the actor in the present tense of the dramatic moment, discovering it for the first time and knowing no more than their character did. The actor playing Romeo might take the poison without knowing that Juliet was going to wake up. Shakespeare’s plays were conceived to play upon the spontaneous poetry of the elusive instant that, for both actors and audience, occurred uniquely. This embrace of the ephemeral moment is both innate to the form of Shakespeare’s plays and it is their subject too – the fleeting brilliance of life. These works were delights that, as transient as butterflies on Summer days, existed without expectation of longevity. The beautiful paradox is that, in recognition of their superlative quality, Shakespeare’s colleagues collated and printed them, so that his words could travel onwards through time and space to become the phenomenon we know today. 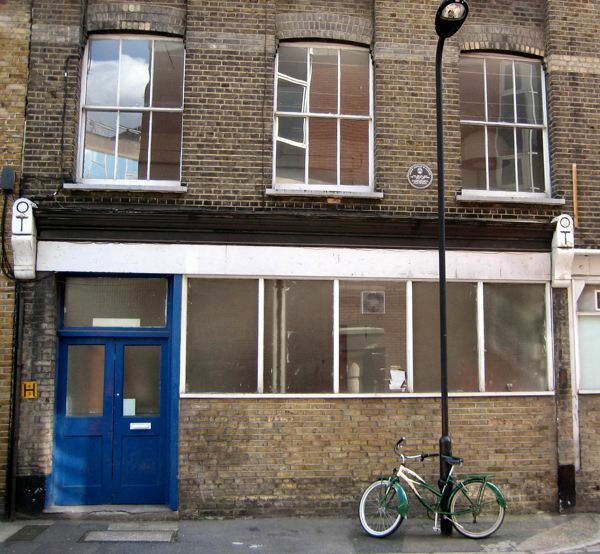 And this modest piece of earth in Shoreditch is where it all began. Releasing me from my idle speculation upon the dust, Heather Knight held up a concrete discovery in triumph. It was an earthenware ale beaker that she found recently, with a lustrous green glaze, which fitted the hand perfectly – a drinking vessel that Shakespeare would recognise, of the style that would be used in the tavern scenes at The Boars’s Head in Henry IV Part One, first performed at The Theatre. Heather has never found a complete beaker before and because it was discovered at The Theatre and is contemporary with Shakespeare, it is a magic artifact. It is something from Shakespeare’s world that he could have seen or touched. Although we can never know, we are permitted to dream. This tiny plate marks the site of The Curtain Theatre that superceded The Theatre, just fifty yards down the road in Hewett St. Somehow, I think that I might have lost contact with your subscription rolls, and had not gotten any notices of your posts for quite a while. I feared that you might have retired from posting! What a delight to find this and the other recent posts. I have been having a wonderful read, catching up on what going on in your part of the world. leave humble readers yearning for more still. Thanks for another wonderful tribute to England’s heritage. There is much that is magic in this entry — the description of the ephemeral nature of plays in the Elizabethan era, the four century “dream” that separates his time from ours, even the paved pathway where I can imagine the merchants and apprentices and courtiers jostling their way into the theater. But for me, the most magical of all was that Heather Knight found an intact beaker! Finding an intact ceramic ANYTHING on a dig is amazing, a gift from time rarely given. Thank you for another grand visit to London. truly fascinating and to my taste. Nothing like it. Magnificent Website. I am a regular to Shakespeare’s theatre in Stratford and the Globe in London. You always come along with the goods. So HUGE Thank You and keep up the Good work Gentle Author. Another superlative piece of writing thank you. I have always loved Shakespeare but you have told me things that I didn’t know e.g. the actors only knowing their own lines and cue lines. I also liked your looking for Shakespeare post when you visited Middle Temple Hall. I too love the Inns of Court and know them well; a real escape into a lost London.